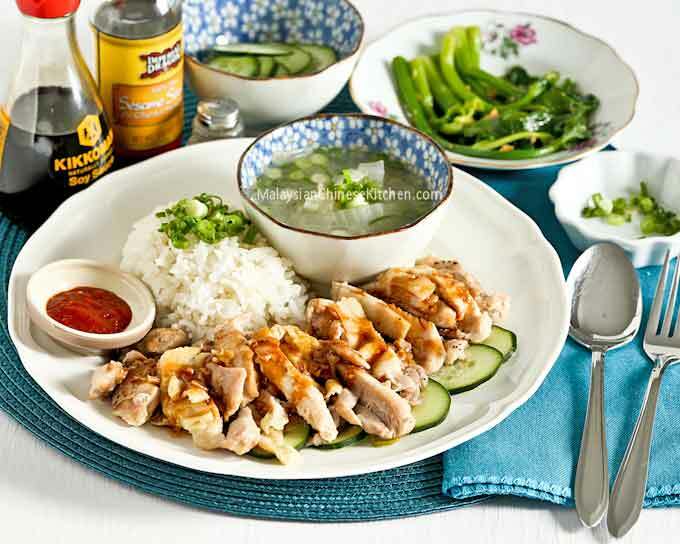 Rice Cooker Hainanese Chicken Rice – the ever popular Malaysian favorite now made easy, convenient, and in small portion using the rice cooker. A must-try! Hello, hello, It’s me Jon! It’s been over a year since I did my last post, Curry Shrimp Fried Rice. Since then, I have graduated from my Master’s program and started work. You have probably heard that we have moved house. Yes, a few major changes took place in those 15 months. Hopefully, I’ll get to appear here more frequently now that things are beginning to settle down. By now you probably know that rice is my carbohydrate of choice even though I have lived here most of my life. Mom cooks rice most days and so I guess that is not at all surprising, right? On deciding what to share for this Mini Series, I figured that a one plate Hainanese Chicken Rice would be a good idea since there aren’t that many ingredients and they can all be easily purchased here. As such Mom decided to share her Gai Lan with Oyster Sauce to complement this Rice Cooker Hainanese Chicken Rice. It was crazy filming two videos in one afternoon. The kitchen was a mess and if you know my Mom, that is not a good thing! Thankfully though, both dishes turned out really well and we enjoyed them both for afternoon snack…YUM! Making Hainanese Chicken Rice in a rice cooker is not new. However, most recipes dump both the rice and chicken in the rice cooker insert. While this is a great one pot meal, it is more like Claypot Chicken Rice cooked in a rice cooker for convenience. The texture of the skin is not silky smooth as it should be. 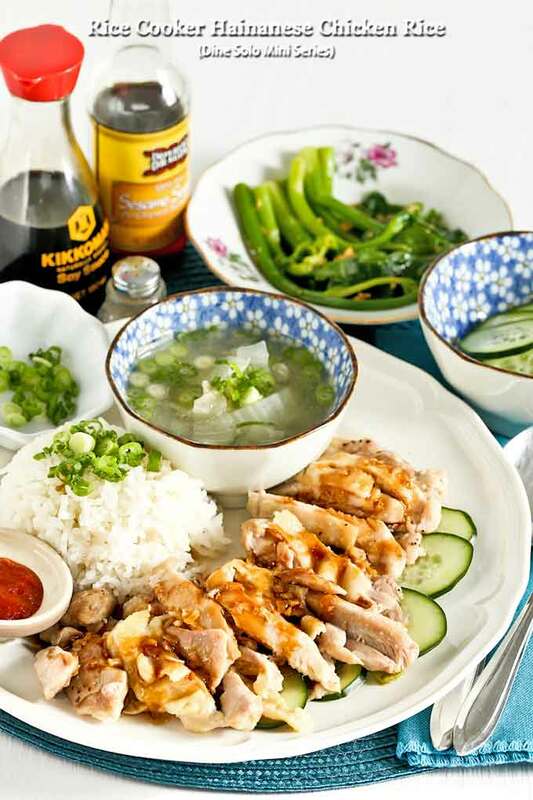 How then can we replicate Mom’s already easy Hainanese Chicken Rice for the single cook with limited time and cooking resources? Mom and I set to work. We tried this recipe three times in getting the timing just right. The first time, the chicken was a little overcooked. We actually got the timing right the second time and so we fine tuned the rest of the preparation (i.e. garlic oyster sauce and soup) to complete just in time for the chicken and rice to finish cooking in our third attempt. As such, you should be able to cook this in around 30 minutes which is great for a single person. Please note that the bones should be removed form the chicken thighs because the cooking time in the rice cooker is very short. 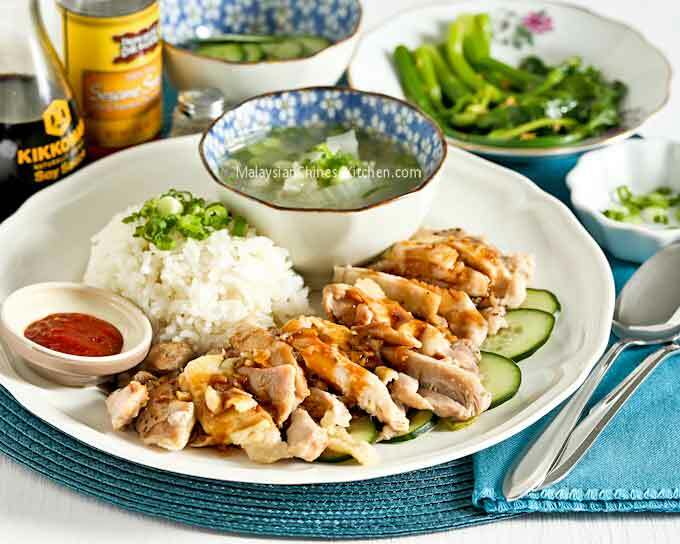 Rice Cooker Hainanese Chicken Rice - the ever popular Malaysian favorite now made easy, convenient, and in small portion using the rice cooker. A must-try! Bring water to boil in the rice cooker. Remove bone from chicken thighs. Reserve the bones. Place on a plate with flesh side up. Sprinkle with salt and pepper. Cut two green onions in half crosswise. Then split them in half lengthwise. Cut remaining green onions thinly for garnishing. Arrange half of the green onions and ginger in rice cooker steaming rack. Transfer chicken into the steaming rack skin side up on top of the green onions and ginger. Arrange the remaining green onions and ginger on top of the chicken. Cover with lid. Place the steaming rack onto the rice cooker and steam chicken for 7 minutes. In the meantime, prepare the sauce and rice. Heat vegetable oil in a small sauce pan. Saute garlic for 30 seconds. Pour half the garlic oil into a small bowl. Return saucepan with remaining garlic oil to the stove. Add rice and stir to coat the rice with the garlic oil. Turn off stove. After 7 minutes, remove the steaming rack from the rice cooker. Scoop out 1½ cups (360ml) chicken broth from the rice cooker leaving ¾ cup (180ml) in the pot. Transfer the rice from the saucepan into the rice cooker pot. Stir in salt to taste. Return the steaming rack on top of the rice cooker to continue cooking. Add soy sauce, oyster sauce, and sesame oil to the small bowl with garlic oil. Mix well with a spoon. Set aside. Pour reserved chicken broth into a small saucepan. Add reserve chicken thigh bones to the saucepan. Cover and bring chicken broth to a boil. Reduce heat and simmer for 10 minutes. After 10 minutes, remove the bones from the saucepan. Season with salt and pepper to taste. Add Napa cabbage. Cover and boil for 2 minutes. Turn off stove. By now, rice and chicken should be cooked and rice cooker should be in keep warm mode. 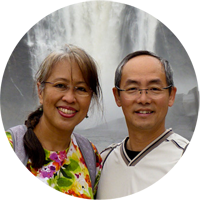 Turn off the rice cooker. Scoop up a bowl of rice onto a plate. Place a few slices of cucumber on the side. Cut chicken into ½ inch pieces and place them on the cucumber slices. Drizzle garlic oyster sauce on the chicken. Serve immediately with garlic chili sauce and a bowl of soup.